The placemat in this beautiful set is made with large and small motifs, which are joined together while working the last round of each motif. Then an edging is worked around the joined motifs for the perfect finish. The coaster is made with only 1 of the large motifs with an edging added to make it square. 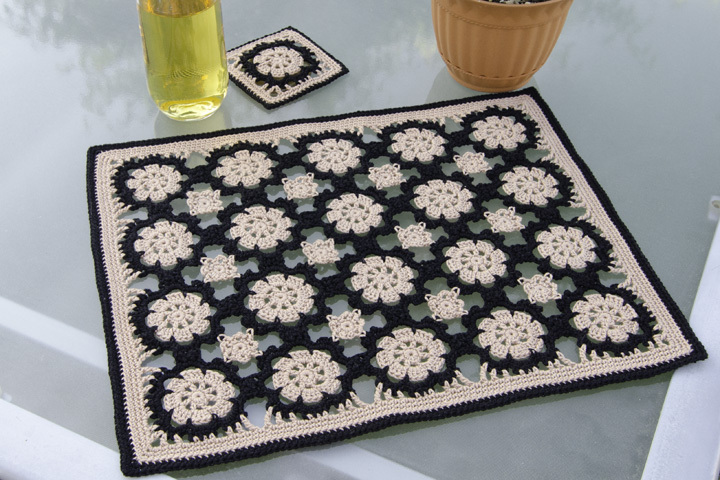 Use any 2 or more colors of size 3 cotton crochet thread you desire to make your placemat and coaster one-of-a-kind! This pattern includes written instructions, a crochet symbol chart for each project, an assembly diagram for the placemat and close up photos of both projects.